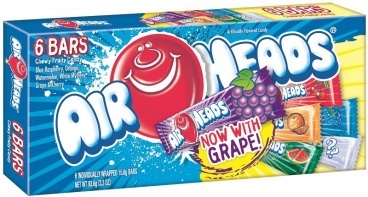 An assortment of 6 individually wrapped Airheads bars. Blue Raspberry, Watermelon, Cherry, Orange, Grape, White Mystery flavors. 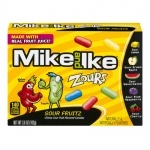 Ingredients: Sugar, Corn Syrup, Maltodextrin, Dextrose, Modified Food Starch (Corn), Partially Hydrogenated Soybean Oil, Contains Less Than 2% of: Citric Acid, Water, Artificial Flavors, Artificial Colors, Red 40, Blue 1, Yellow 6, Yellow 5. Manufactured In A Facility That Processes Wheat Flour.